Last year I read Touch of Power by Maria V. Snyder and I was obsessed with it. It has a Graceling by Kristin Cashore feeling to it, but better. Oh yes, I think it is better than Graceling. 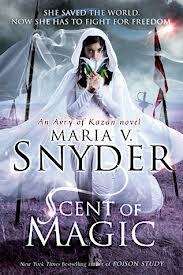 I'm not reading book 2: Scent of Magic and it is everything I was hoping for! I'm about half way into it right now and I can't wait for more reading time. I highly recommend this series. "We don't take orders from you, Sergeant." Quain said. "Your man tried to assassinate-"
"He isn't mine. My man has eyes that change color with the seasons." *I'm participating in Teaser Tuesday at Should Be Reading. Where is her man than? Great teaser! So can't wait to read this. You're so lucky to be reading it. I liked her "Study" books, I really should get to these. Good teaser. Beautiful cover that raises lots of questions and makes me curious about the book's contents. Love your teaser. I want to know more about this man with the changeable eyes. Ooh... I have been sent this book from Harlequin! Can't wait to read it!! Great tease! Better than Graceling? I will have to check out this book. Thanks for the awesome teaser! Cute teaser. I love the quote about his eyes. I still need to check out this series. I thought it was better than Graceling too! Very similar, but yes, Touch of Power is way better!